The Center hosted internationally known simulation expert Dr. Jen Arnold as part of her visit to Hershey as part of an invited lectureship in the Department of pediatrics. Dr. Arnold spent two hours with the simulation staff answering questions about the role of simulation in healthcare. She also participated in several simulations with pediatric residents, serving both as the simulator operator and the debriefer for the scenarios. Dr. Arnold is also widely known as one of the stars TLC’s The Little Couple. During her visit she graciously greeted fans of the show, posing for several photos with them (including our staff). Finally, after nearly three years of planning, false starts and construction, the simulation center has some new simulation space. Modeled after the actual ICU room a highly infectious disease patient (such as Ebola or SARS) would be placed, the new ICU room was opened for use. 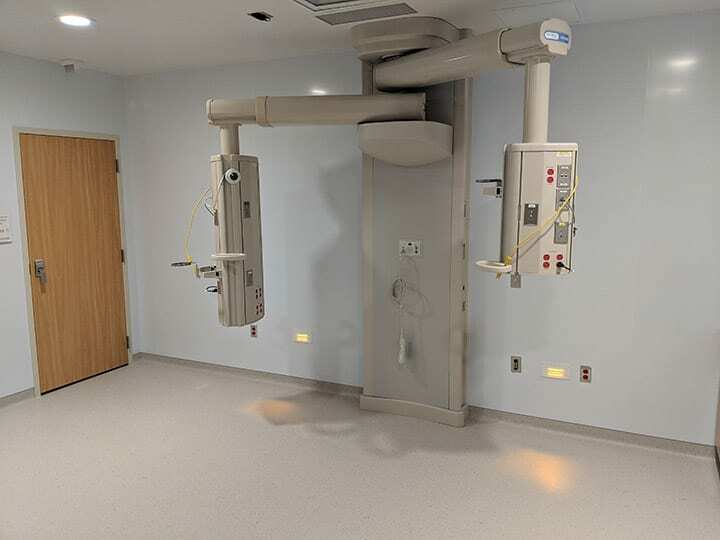 While there are still some minor details to finish (including installing new patient monitors), the room is operational and features large open floor space with two movable medical gas booms. The suite of rooms also features donning and doffing rooms for protective garb and a dedicated control room. The Center’s Simulation Education and Research Fellowship continues to grow. 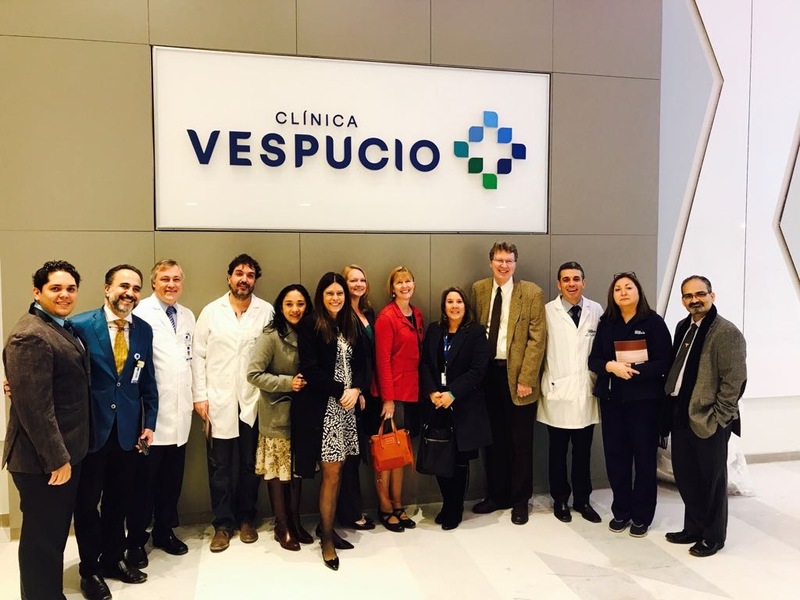 In the past few months we welcomed Aldo Crespo, MD, the Curriculum and Academic Coordinator at O&M Medical School in Santo Domingo, Dominican Republic. Dr. Crespo spent three months at Hershey full-time in the fellowship and is now completing his graduation requirements back home over the summer. He will be rejoining us at Hershey in October to finish the program. Also joining the fellowship program is Alexander Answine, MD. Dr. Answine is recently graduated from the American University of the Caribbean School of Medicine. He will be with the Clinical Simulation Center for the next year as he prepares to enter residency. After a long wait, construction of the Center’s new Highly Infectious Disease ICU simulation room is nearly complete. This room is modeled after the real patient room in the hospital where a highly infectious disease patient will be admitted. With entry and exit rooms for donning and doffing personal protective attire, the room will also help provide some much needed growth space for the Center. It will be completed on September 28. Dr. Rivera, along with Simulation Educator Theresa Brosche and Dr. Dan Weber, presented on this program at the Pennsylvania’s Healthcare Mosaic conference in Philadelphia in June. Dr. Rivera will also be presenting a poster on the course at the Latina Researchers Network and Conference in New York City later this month. International Meeting on Simulation in Healthcare (IMSH) Preview – January 13-17, 2018, Los Angeles, CA. This past year was very productive for Penn State simulation affiliated faculty and staff for contributions to the field. Faculty and staff affiliated with the Penn State Hershey Clinical Simulation Center had 10 peer-reviewed publications during 2017. Other academic output from the Center included 16 conference presentations, 6 poster presentations, one webinar, and one book chapter. Adhikary S, McQuillan P, Fortunato M, Owen D, Liu W-M, Thiruvenkatarajan V. A manikin‑based evaluation of a teaching modality for ultrasound‑guided infraclavicular longitudinal in‑plane axillary vein cannulation in comparison with ultrasound‑guided internal jugular vein cannulation: A pilot study. Journal of Anaesthesiology Clinical Pharmacology. 2017; 33: 337-341. Gyory R, Buchle SE, Rodgers DL, & Lubin JS. (2017). The efficacy of LUCAS in prehospital cardiac arrest scenarios: A crossover mannequin study. Western Journal of Emergency Medicine. 18(3); 437-445. Haidet P, Jarecke J, Yang C, Teal CR, Street Jr RL, Stuckey H. Using Jazz as a Metaphor to Teach Improvisational Communication Skills. Healthcare. 2017; 5 (41): doi:10.3390/healthcare5030041. McIvor WR, Banerjee A, Boulet JR, Bekhuis T, Tseytlin E, Torsher L,DeMaria S, Rask JP, Shotwell MS, Burden A, Cooper JB, Gaba DM, Levine A, Park C, Sinz EH, Steadman RH, & Weinger MB. A Taxonomy of Delivery and Documentation Deviations During Delivery of High-Fidelity Simulations. Simulation in Healthcare. 2017; 12(1); 1–8. Neylan CJ, Nelson EF, Dumon KR, Morris JB, Williams NN, Dempsey DT, Kelz RR, Fisher CS, Allen SR. Medical School Surgical Boot Camps: A Systematic Review. J Surg Educ. 2017; 74(3). 384-389. Passi R, Doheny KK, Gordin Y, Hinssen H, Palmer C. Electrical Grounding Improves Vagal Tone in Preterm Infants. Neonatology. 2017; 112: 187-192. Pheister M, Stagno S, Cotes R, Prabhakar D, Mahr F, Crowell A, Schwartz A. Simulated Patients and Scenarios to Assess and Teach Psychiatry Residents. Acad Psychiatry. 2017 Feb;41(1):114-117. doi: 10.1007/s40596-015-0477-8. Epub 2016 Jan 13. Weinger MD, Banerjee A, Burden AR, McIvor WR, Boulet J, Cooper JB, Steadman R, Shotwell MS, Slagle JM, DeMaria S Jr, Torsher L, Sinz E, Levine AI, Rask J, Davis F, Park C, Gaba DM. Simulation-based assessment of the management of critical events by board-certified anesthesiologists. Anesthesiology, 2017; 127(3): 475-489. Theresa Brosche, MSN, RN, CCRN-K, has joined the department as the Simulation Educator. She has considerable experience teaching with simulation in her prior position in Virginia at a simulation center supporting nursing and health careers programs. She is also a former Clinical Head Nurse at the Milton S. Hershey Medical Center. Please welcome Theresa to the Hershey Clinical Simulation Center. Registration information will be available soon. 7-Sigma Airway Trainer – Highly realistic airway manikin. HeartWorks Transthoracic Echo Mobile – Wearable chest plate to conduct TTE on patient actors or manikins. Simulab Paracentesis Simulator – Ultrasound capable paracentesis simulator. New graduates transitioning into the professional practice role of RN are confronted with a broad range and scope of transitional changes. This period is described as Transition Shock. Nursing needs to find ways to help new nurses transition into their new roles of professional nurse for continued patient safety and to keep them in the profession, as many decide to leave due the multiple stressors of patient care and workplace responsibilities. The use of simulation as a teaching/learning method in education and practice is becoming more common, and one way to help novice nurses. This presentation will explore how simulation can positively impact the experience gaps novice nurses face as they enter the professional role of nursing. This free webinar is sponsored by The Global Institute for Simulation Training and Education Management Solutions. Be sure to check our Events calendar for updated educational opportunities including other webinars. Simulation Educator Sally Rudy MSN RN-BC CHSE and Resuscitation Sciences Training Center (RSTC) Program Manager Tammi Bortner BSN RN will be retiring July 8. The Center thanks both Sally and Tammi for their service to the Milton S. Hershey Medical Center and wishes both of them enjoyment in their retirement. Franklin (Frank) A. Banfer, III, JD BSN RN CEN NREMTP has assumed the role of Program Manager for the Resuscitation Sciences Training Center (RSTC). Wendy Giulivo is now the RSTC Administrative Secretary. 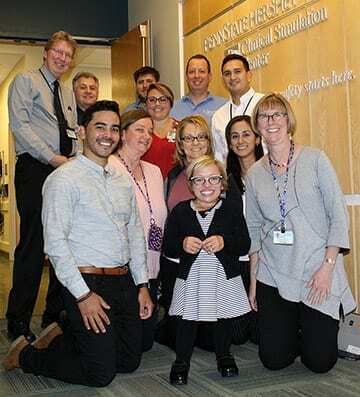 Simulation Educator Angel Diaz Sanchez MD has moved on to his anesthesia residency position at the Penn State Health Milton S. Hershey Medical Center. Interviews are in process now and a new educator will be appointed soon. 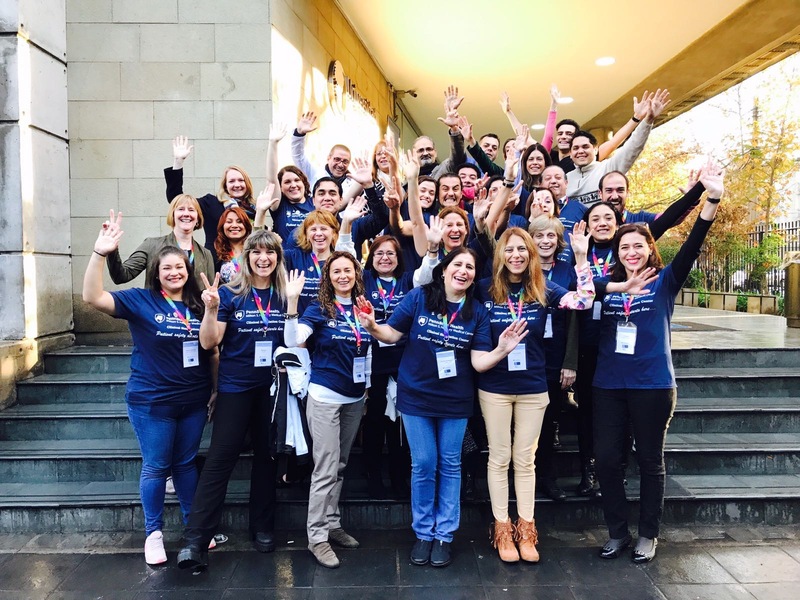 The Center’s Simulation Instructor Course became an international program with staff and faculty leading a course in Santiago, Chile. Center director Elizabeth Sinz MD, manager David Rodgers EdD, simulation educator Angel Diaz Sanchez MD, simulation Fellow Hector Lopez MD, and surgery resident Cassie Sontag MD assisted in leading South American-based simulation faculty in a course that included 22 simulation instructors from five countries (Chile, Argentina, Costa Rica, Uruguay, and Bolivia). 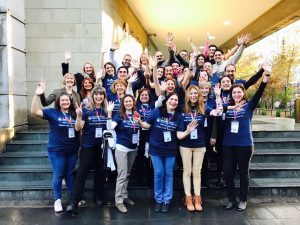 The four-day course was a success and has helped generate renewed excitement in South America for using simulation as a teaching tool. 22 learners from five countries pose on the steps at Universidad Finis Terrae in Santiago , Chile. 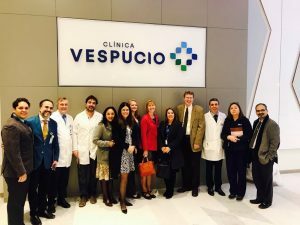 Course Faculty including five from Penn State tour a hospital in Santiago, Chile. More information is found at this LINK from the host institution, Universidad Finis Terrae (in Spanish). 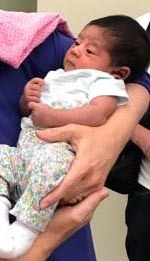 Congratulations to Simulation Fellow Lidys Rivera MD and her husband Armando for the birth of their baby girl, Valeria. Penn State Hershey Simulation Instructor Course: Two courses in 2017, July 10-14, and October 2-6. Visit the Instructor Course page for more information. Levine J, Jones-Bell LJ, Crim H, Dannenmeyer D, Halford-Cook C, Mills J, More L, Parker NW, Schubert-Bob P, Shelton M, Storhoff S, & Tealey J. (2017). Ambulatory Care Registered Nurse Residency Program: Transition to the Specialty Of Ambulatory Care (J. Levine, Ed). American Academy of Ambulatory Care Nursing, Pittman, NJ. Gyory R, Buchle SE, Rodgers DL, & Lubin JS. The efficacy of LUCAS in prehospital cardiac arrest scenarios: A crossover mannequin study. Western Journal of Emergency Medicine. 2017; 18(3); 437-445. Mooney JJ, Sarwani N, Coleman ML, & Fotos JS. Evaluation of Three-Dimensional Printed Materials for Simulation by Computed Tomography and Ultrasound Imaging. Simulation in Healthcare. 2017; 12(3), 182-188. Neylan CJ, Nelson EF, Dumon KR, Morris JB, Williams NN, Dempsey DT, Kelz RR, Fisher CS, & Allen SR. Medical School Surgical Boot Camps: A Systematic Review. J Surg Educ. 2017; 74(3); 384-389. Mooney, JJ. (2017). Analysis of Soft Tissue Materials for Simulation Development. Poster presentation at International Pediatric Simulation Society Symposium and Workshops, Boston, MA. Mooney, JJ. (2017). Development of Torso/Spine Simulant for Interventional Procedures. Poster presentation at International Pediatric Simulation Society Symposium and Workshops, Boston, MA. So far in 2017, Penn State simulation faculty and staff have made 11 conference presentations. Welcome to the Web Home for the Penn State Hershey Clinical Simulation Center. Explore the site through the drop down menus above and be sure to register your e-mail below to get periodic updates on faculty development programs and new equipment announcements. Enter your e-mail address here to receive Blog updates including upcoming educational opportunities.